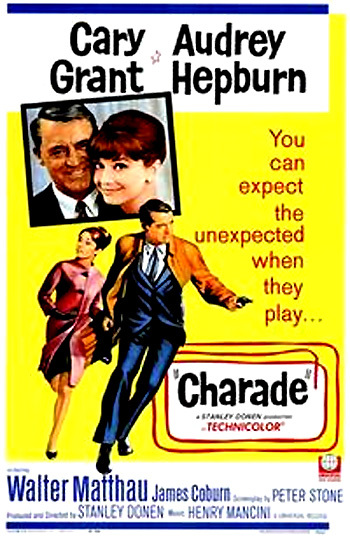 Charade (1963) is a classic cat-and-mouse, "Hitchcockian" romantic comedy and enigmatic thriller all in one, from director Stanley Donen - known more for his musicals such as On the Town (1949), Singin' in the Rain (1952), It's Always Fair Weather (1955), and The Pajama Game (1957). The plot twisting, witty, and suspenseful film (similar to Hitchcock's The 39 Steps (1935), To Catch a Thief (1955), North by Northwest (1959), and the entries in the James Bond series), shot on sets and on-location in Paris, is a sophisticated, yet off-balanced combination of thrills and comedy from screenwriter Peter Stone's first film screenplay. This mystery-romance is a tale about the search for missing and stolen gold treasure worth $250,000 by five survivors of WWII who were in the Office of Strategic Services (OSS) together, and are now threatening the newly-widowed and estranged wife of one of the accomplices. "You can expect the unexpected when they play..."
Jonathan Demme's stylish The Truth About Charlie (2002) was a remake with numerous French New Wave references, starring Thandie Newton and Mark Wahlberg in the lead roles. The opening is a tongue-in-cheek sequence set at a swanky ski resort at Mont d’ Arbois in Megeve, Switzerland. A gun is pointed at lovely Regina ("Reggie") Lampert (Audrey Hepburn) on her holiday - held in the grip of the young son of her friend - it was only a water pistol! Upon her return to glittering Paris, the lovely Reggie is shocked to find out that her husband Charles, who she was planning to divorce anyway, has been brutally murdered during her absence, by being thrown from a train. As the penniless young widow attempts to untangle the mystery, she is given some of his few existing possessions in a Lufthansa travel bag: a letter addressed to her, a ticket to Venezuela, passports in multiple names and other items. At the scene of the funeral of Reggie's murdered husband Charles, three strange men (three of the accomplices) - later identified as Tex Panthollow (James Coburn), Herman Scobie (George Kennedy), and Leopold W. Gideon (Ned Glass), sternly pay their respects by staring into the casket to assure themselves that the man is dead. A suave, well-meaning, and handsome American stranger 'Peter Joshua' (almost 60 year old Cary Grant, in one of his last romantic lead roles, and in his sole teaming with Hepburn) offers to help, but so do many other men who begin to harrass her. Are the beguiling Joshua's motives honest and above reproach, or is he hiding secrets from her, and not disclosing his true identity? In their early conversations together, they often have witty (and goofy) dialogues together: (Reggie: "Do you know what's wrong with you?" Peter: "No, what?" Reggie: "Absolutely nothing"). The growing romance between the two main characters includes many suggestive lines of dialogue. There were many memorable twists and turns in the plot, and bizarre and violent situations that include a classic, suspenseful, violent and scary fight scene, progressing from a hotel room to the slippery rooftop of the Parisian office of American Express (with a backdrop of neon lights), between Peter and thug Herman Scobie (George Kennedy) with an artificial hooked hand. During the search to find the treasure, accomplice Tex Panthollow suddenly realizes (in a creatively-filmed sequence) at a Thursday outdoor stamp fair market that Charles must have bought expensive rare stamps there and placed them on an envelope to hide his $250,000 worth of treasure. Reggie visits a kindly rare stamp dealer Mr. Felix (Paul Bonifas) with a large magnifying glass, who reveals that the stamps torn off an envelope (addressed to her from her husband) are extremely valuable. Bartholomew: Mrs. Lampert, he wants the money for himself. That's all he's ever wanted. Reggie: He's with the CIA. I saw him at the embassy. Adam: I tell you, he's Carson Dyle. Adam: Reggie, I beg you. Just trust me once more. Adam: I can't think of a reason in the world why you should. ...it takes a lot of bullets to kill me. They left me there with five of them in my legs and my stomach. Mrs. Lampert, they knew I was still alive, but they left me there. I spent 10 months in a German prison camp with nothing to stop the pain. They left me there, Mrs. Lampert. They deserved to die...You've got the money now. It belongs to me. Mrs. Lampert, they knew I was still alive, but they left me there. That's why I had to kill them, all four of them. Please believe me, Mrs. Lampert. I'll kill you, too. It won't make any difference. It's no use. You're running out of time. I've come too far to turn back. I swear, I'll kill you. Mrs. Lampert: I'm sorry I thought you were the murderer, but how was I to know he was as big a liar as you are? 'Adam': Is that all the gratitude I get for saving your hide? In the denouement the next morning, "Adam" and Reggie join together and visit the Treasury Department, but he insists that she enter alone into the second floor office. To her shock and amazement in the closing scene, she finds him in an inner office, sitting at a desk - he is revealed to be a good guy - none other than undercover agent Mr. Brian Cruikshank. The scene also confirms the hidden fortune - the stamps, that were earlier graciously surrendered by an elderly stamp collector ("For a few moments, they were mine. That is enough"). Reggie: ...Marriage license. Did you say marriage license? Cruikshank: Now don't change the subject. Just give me the stamps. Reggie: Oh, I love you, Adam...Alex...Peter...Brian...(his identities are seen in split-screen) Whatever your name is. Oh, I love you. I hope we have a lot of boys and we can name them all after you. Cruikshank: Well, before we start that, may I have the stamps?